Why is communist nostalgia on the rise in Eastern Europe, and is it more than just a passing fad? 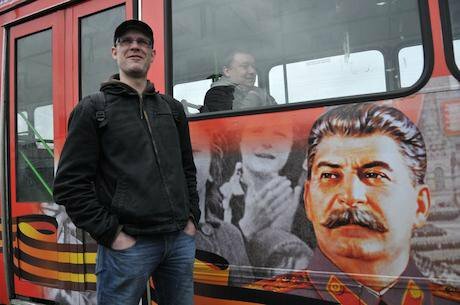 A Saint Petersburg bus with Stalin's portrait. Viktor Loginov/Wikipedia. Free to use and shareThere is absolutely no doubt that the transition from state socialism to liberal democracy in many Eastern European states has been a long and bumpy ride. Political liberalisation and the shift from a Soviet command economy to a free market economy have caused various socio-economic ramifications for the peoples of this vast region through failed promises and expectations. While the problems of transition vary from country to country, the most common concerns range from severe unemployment to a lack of job security and, inevitably, economic instability. Stagnating economic growth in many post-communist states has, however, also produced a new and unforeseen phenomenon: communist nostalgia. The term nostalgia originates from the Greek root words nostos (returning home) and algia (longing) and thus the word’s meaning is synonymous with the term homesickness. Nostalgia has consistently been attributed to romanticising the past in the present to make it look better. Within the present-day Eastern European context, nostalgia refers to an increasingly positive outlook on the pre-1989 communist past. Reasons for this include the safety and security ensured under state socialism and the major social and economic developments propelled by the command economy. Other factors contributing to this nostalgia are the failures and uncertainties of the existing system of capitalist liberal democracy that now engulf Eastern Europe. Communist nostalgia, therefore, is a growing phenomenon in the post-communist states of Eastern Europe due to the successful progress and advances made before 1989 and the failed transition and unmet expectations of so-called ‘freedom’ and capitalism. State socialism prompted massive and unprecedented social and economic developments throughout the region. Before elaborating on these advances, however, a misconception originating in the West about the ordinary lives of Eastern Europeans during the Soviet era must be addressed. After WWII, the West constantly viewed Eastern Europe as a giant prison camp of 90 million people under communist repression with the U.S. Congress even passing an arbitrary resolution denoting them as “captive nations”. This might have been true throughout the Stalin years but not so since the late 1950s. Until the fall of the Berlin Wall in 1989, the President of the US was required every year to declare something called Captive Nations Week. At the time the people of Eastern Europe did not consider themselves as being held “captive” and even laughed at the term. Another fallacy of this label’s usage by the US was its implication that Eastern Europe was free before becoming the Eastern Bloc. Instead, all states in the region, with the exception of Czechoslovakia, were ruled by ruthless and oppressive monarchs or despots of one kind or another. The American labelling of these nations as “captive” during the Cold War epitomised the ignorance of Western propaganda at the time which was aimed at denouncing everything that was communist. If the people of Eastern Europe were actually “captives” then what explains each respective nation’s receptiveness to the political socialisation mechanisms of the Communist Party. The communist system was very successful at indoctrinating and transmitting socialist beliefs to the masses. The populations of many of these states accepted and internalised values such as socialist patriotism, which converged with the traditional nationalist and other pre-existing norms of the region. The political socialisation that took place pre-1989, therefore, is definitely a contributing factor to the level of communist nostalgia that exists in many Eastern European states today. Not only did the communist system succeed in transmitting socialist values to the populations of Eastern Europe, but also in industrialising and transforming their economies. Huge developments in infrastructure, manufacturing and industry dominated the scene all over Eastern Europe, which was largely agrarian and underdeveloped before WWII. As of the late 1970s, for example, Poland’s state-owned steel company, Zjednoczenie Hutnictwa Zelasa i Stali, was bigger than Great Britain’s at the time. It ranked one notch ahead of Bethlehem Steel Corporation and one behind United States Steel in the world output listing. The People’s Republic of Poland also became a major copper producer and exporter, not to mention the fourth largest coal producer in the world – behind the US, Russia and China. During the 1970s, the Polish mining industry was so modernised that it even sold machinery and expertise to America. Hungary became the largest manufacturer of cross-country and city buses in all of Europe. Throughout the 1970s, the Ikarus factory exported these buses to the US where they were used by municipal transit systems in Portland, Oregon and Los Angeles. The Hungarian People’s Republic also planned an assault on the electronics and data processing market with a state-owned company called Videoton (started in 1969) located in Budapest. By the late 1970s, it was doing more than $300 million worth of business annually. Bulgaria completely industrialised its agricultural sector in the same time period, operating 170 agro-industrial complexes which provided all of Europe with fresh fruits and vegetables, high-quality canned goods and preserves. One of Bulgaria’s government-owned companies also managed Europe’s largest international trucking fleet which carried tomatoes from Sofia to Denmark, Black Sea grapes to Holland and West German tools to Turkey. By 1979, Bulgarian economic decision makers initiated a reform movement that put greater emphasis on efficiency of production and decentralised the economy, especially in light industry and agriculture. Central planning thus became less rigid by placing more consideration on surrounding economic realities. Bulgaria’s successful attempt to strike equilibrium between agricultural development and industrial production specialisation undoubtedly expanded and advanced the national economy by the 1980s. There are numerous reasons for explaining East Germany’s successful centralised economic system; having a Western industrial heritage, high levels of economic advancement and generations of skilled workers are all contributing factors. East Germany’s economic management awarded innovation and efficiency, which allowed the communist state to create products of the highest quality in the Eastern Bloc. Although the nation’s economy was not perfect, scarcities were minimal and central planning seemed to work quite well. Life for the average Eastern European living under state socialism was infinitely better than it was before WWII. Per capita annual income in the year 1974, according to figures provided by the United Nations, were $3,000 in Czechoslovakia, $2,300 in Hungary, $2,000 in Poland, $1,650 in Bulgaria and $1,200 in Romania. This compared to $6,000 in West Germany, $3,600 in England, $2,700 in Italy, $2,200 in Ireland and $2,200 in Spain (all in the same year). It is important to note that since there were very few extremely rich or extremely poor people in the socialist states, “per capita annual income” is actually closer to real average income per person as compared to nations in Western Europe. When contrasting these statistics, there seems to be little difference in economic wealth between the socialist states and their Western counterparts. The economic and technological achievements made during the Soviet era were accompanied by massive investments in social programmes and public services. These included health care, education and day-care centres, which the communist system ensured were either affordable or free of charge with “One of the major characteristics of the previous state socialist societies was the comprehensive provision of a state-financed and delivered health system”. Another inherent attribute to the socialist state was the strong dedication to education for all and the ending of illiteracy: there is absolutely no denying that the communist parties of Eastern Europe did much to educate their people. Illiteracy, which was once widespread throughout the entire region, was practically eliminated by the full provision of universal and free schooling. Under the communist system of social development there was also substantial expansion of post-secondary education in a number of university and college level institutions as well as an increase in the numbers of students. The most preeminent example was Poland, where the number of post-secondary institutions exploded from 28 in 1939 to 89 in the late 1970s, while the number of students grew from 14 per 1,000 (before WWII) to 145 per 1,000 in 1977. Most Eastern European students before 1989 obtained some kind of government assistance covering tuition, residence and books. These scholarship programmes and grants did, however, vary from country to country, as did the number of students receiving financial aid. In all the Eastern Bloc countries, grants and scholarships were given based on both family incomes and academic performance. Although education and healthcare constituted only part of the public services offered to Eastern Europeans, they were fundamental social initiatives for the communist regimes. This outstanding level of economic and social progress, especially in healthcare and education, is fundamental to the growing disillusionment and distaste for the capitalist system in contemporary Eastern Europe. Conducting a comprehensive public opinion poll in the 1990s, sociologist Stephen White acquired survey data denoting the rising public support for the socialist system in comparison with the situation following political and economic reform. The social and economic downturns following the transformation have produced major public disapproval - these surveys indicate that substantial segments of the populations in Eastern Europe find life worse under post-Soviet conditions. Most people in these countries have gained an appreciation for the many positive features of the Soviet system: the role of the state over employment, the provision of social welfare, equality and public order. According to the same surveys, post-communist rule is considered to be remote, parasitic and incompetent and is also associated with crime and corruption. Every state throughout the region has had difficulty adjusting to the new political and economic order, some more so than others. An intriguing example is East Germany, whose citizens experienced immense psychological devastation from the abrupt transition to capitalism. A clear image of ‘the good old days’ resonated amongst post-communist citizens of the former GDR when they were forced to adopt a different and more individualistic way of life because their previous lives were now deemed worthless. “‘Literally over a single night, all the things that had been taken for granted were no longer valid’; the natural result was a ‘serious identity crisis’ that was reflected in ‘confusion and frustration’”. The current economic situation in the New German States (former GDR) is no different from the psychological one. Mass privatisation and deindustrialisation has required West German subsidies of approximately €130 billion annually to the crumbling East German economy, which has still not recovered. The troubling situation is made even worse by continuing demographic problems. With increasing unemployment and a dropping birth rate, many young people are migrating to West Germany or other parts of Europe due to the lack of apprenticeship training positions in the East. Consequently, East German businesses have experienced a severe decline of potential employees to maintain or expand their workforce. Migration, along with the death surplus of the post-communist state, added up to a population decrease of 2.2 million people from 16.7 million in mid-1989 to 14.5 million in 2005. All these factors make East Germany an interesting case study when examining the failed economic and political reforms brought about by democratic transition. Another case study urgently requiring attention is the failed attempt to democratise and integrate Bulgaria into the global capitalist system (neo-liberalism). In the decade right after the dissolution of the Soviet Union (1992-2002), many rural areas of the Bulgarian countryside embarked on a transformative and disorienting experience. Traditions and rituals from the Soviet era were threatened by economic privatisation and non-family village relations were dismantled by newly formed social and political divisions. Much like the previous case discussed, the Bulgarian countryside also diminished from massive emigration. Mike Donkin, a BBC reporter and journalist, stated in 2006 that Bulgaria had the fastest rate of population decline in all of Europe: “and the sense of abandonment is even greater in the countryside…Scattered across the landscape now are dozens of deserted or almost deserted villages”. The most devastating ramification of democratic transition and economic privatisation was the loss of jobs and professional occupations in Bulgarian villages. To make matters even worse, the negligent liquidation of collective farms reduced them to subsistence farming and production (a 19th century mechanism). For these reasons, Bulgaria has suffered economic and social devastation ever since the fall of state socialism. This helps to explain the strong sense of communist nostalgia that exists today in Bulgaria, especially in the countryside. Very much like Bulgaria and East Germany, other Eastern European states have also experienced vast economic inequalities and uncertainties. Ultimately, this has fostered a negative assessment of the capitalist present and a positive view of the communist past, which therefore explains the pre-eminence of communist nostalgia in post-communist politics. In his article, Communist Nostalgia and its Consequences in Russia, Belarus and Ukraine, Stephen White addresses his research literature and survey data from the 1990s indicating that more than half the adult population in the entire East European region gave a positive assessment of the socialist economic system. The overall average for the post-communist states in 1998 was 54% - with the highest support in Ukraine and Belarus at 90% and 78% respectively. This was a significant increase from the amount of support communism had in 1991 - 36% - which again was at its highest in the former Soviet republics. White’s data demonstrates an interesting correlation. The evidence suggests that nostalgia for the economic stability and equality of the communist past increased with the duration of failed economic reforms and instability since 1989. Since communist nostalgia is a growing phenomenon in Eastern Europe today, it has different ways of manifesting itself amongst post-communist citizens. Nostalgic types are quite particular in their reverence for the past and share different things they are nostalgic about (this is shown in their electoral support for communist and socialist parties). Most of these individuals are nostalgic for job security, free education and reliable and affordable healthcare. This is because most Eastern Europeans remember and long for the vast social programmes and services that are no longer offered under capitalism. The concept of nostalgia quickly became an inherent quality of post-communist politics. The safety and security guaranteed under state socialism co-mingled with the failures and uncertainties of the existing capitalist system and liberal democracy has made this happen. It is interesting to speculate what the future entails for the entire region and whether or not this nostalgia will transform into something much bigger than what it already is.